Winter Wedding Trends That You’ll Say ‘I DO’ To! While the chills of winter may be firmly planted at your door, it certainly doesn’t have to mean the death of all things romantic. If you’re the type of bride-to-be who believes that a blanket of white snow is the must-have accessory for her wedding, then read on. From the pastel colours of the season to all-white wedding cake, we present you with the hottest winter wedding trends of the season, each guaranteed to turn your winter wedding into the Fairytale you always dreamt it would be. As a tribute to the snowy surrounding, all-white wedding cakes with clean lines are the must-have items of any winter wedding this season. But fear not, all-white doesn’t have to mean boring. 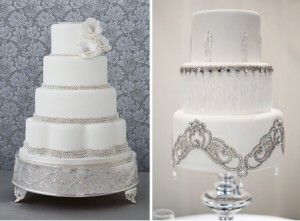 Sugar flowers, rich flavors and even metallic accents are all welcome additions to the all-white wedding cake. Present your cake on a styled stand or amidst fresh evergreen, and you’ll have a wedding cake that looks too good to eat – but tastes too good not to! The colour trends for this coming winter celebrate all the beauty of the season in its simplicity. Basic colours on which you can base your winter wedding include natural wintry greens, whites and ivories. Add some colour to the event and accent your big event with dusty pastels for a subtle twist on the neutral basics. If bold statements are more your thing, then feel free to invest in some cherry red or black and gold, to add something a little different to the décor and your flowers. Much like your all-white wedding cake, bridal bouquets are receiving some ‘bling’ of their own. Upgrade the traditional floral bouquet with the addition of crystals, vintage brooches and other shiny things. Complete the whole thing by opting for a more dramatic flower arrangement, made up of wildflowers and herbs, rather than the usual roses and lilies. With the chill of winter an inescapable characteristic of the season, you’d do well to plan with this in mind. Make use of the wedding cocktail hour by offering warm drinks. With a choice of drinks including hot chocolate, gluhwein, eggnog and Irish coffee, you’ll certainly take the chill off of what promises to be one of the best days of your life. The photography is certainly one of the most important parts of your wedding – offering you keepsakes in the form of photographs of your big day. The classic black-and-white weddings photographs of yesteryear are regaining popularity – and are a perfect choice when it comes to portrait shots to be taken on your winter wedding day. Capable of capturing the most beautiful moments beautifully, the black-and-white photographs will deliver you back into the magic of your special day whenever you view them for many years to come. Just because your wedding day ends, doesn’t mean that the good feelings of it have to – and it certainly doesn’t mean that winter’s come to an end either. Put these universal truths to good use and give your guests a treat by packing Mason jars with all the ingredients your guests will need to make Hot Cocoa. Not only does this serve as a sweet reminder of your winter wedding, but it also lets yours guests know how thankful you are that they shared your special day with you. Robyn Porteous is a Creative Content Manager and the staff writer for Brighton Short Breaks, a specialist provider of short-term accommodation in Brighton. Her Google+ page contains information on her other writing. You can also follow her on Twitter @RobynPorteous.